DAISY BAND - ala Seeck and Barb & Don Chamberlain. DAISY BAND Tankard Set: Barbara Chamberlain says there is evidence of a former silver band around this pitcher, indicating a lack of firing at the time the silver band was applied, allowing it to become somewhat worn away before, or while the colored enameling was applied. 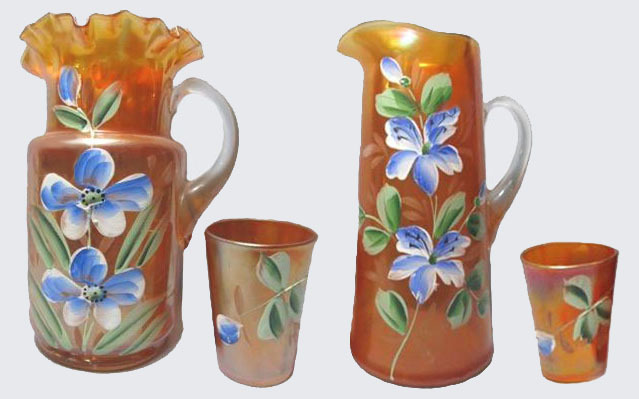 In the factory a colored ground frit which is a powdered glass, mixed with a shellac base to create a firm hold on the smooth surface of the base glass is applied to the molded glass pitcher (by the artist). Then the pitcher is sent to the lyre to secure the frit to the base glass. Applied in this manner, the silver paint would NOT wash off! Left - INTERIOR DRAPE - Courtesy Sandy Sage. Middle - INTERIOR DRAPE, Courtesy Barb & Don Chamberlain. Right - INTERIOR DRAPE - Gerald & Candy Brockmeyer. 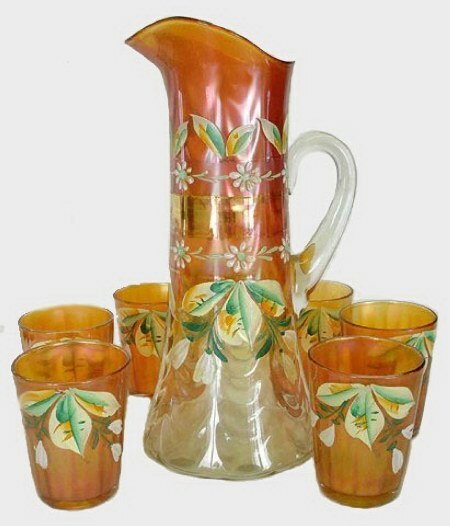 DAISY BAND Pitchers: Basically, these are Interior Drape design pitchers. The example owned by Gerald and Candy Brockmeyer have silver bands which were likely applied and fired on, prior to the time the enameling was applied at the factory. That firing has maintained the silver finish over the years. Obviously, two different artists did the painting, with the slight differences being evident on close inspection. (Different strokes by different folks!) The example owned by Sandy Sage is painted more like the Chamberlain’s. When the two pitchers were set side by side for close comparison, the results are as follows. MAGNOLIA Table Set - Courtesy Burns Auction. 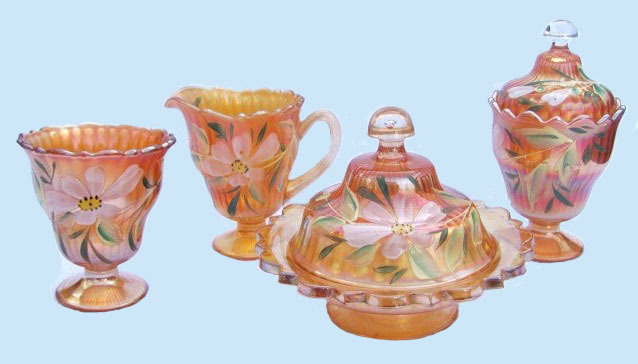 MAGNOLIA Table set: In our Decorated Carnival Glass – Part 1 we display a berry set owned for many years by Jim and Ardonna Bucher. It has the same painted design as seen on this table set. Lacking a name for that pattern at the time the segment was composed, we simply called it Stippled Rays, which is obviously the same interior pattern found on this table set. Records for these decorated items are “sketchy”, at best and the auctioneers tend to “develop a name” in some cases, whenever an unusual pattern presents itself for their advertising purposes. DIANTHUS Water set: While this set in white is shown in the Heacock/Fenton book as Prism Band pattern, we believe it to be Dianthus. 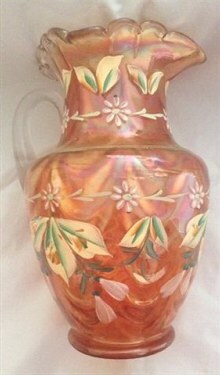 We display the white example in Decorated Fenton Water Sets – Part 1. One notable difference is the painted gold band around this green set; whereas the white tankard has none! (Another varying artistic touch!) There are tankards in this design which lack the gold band. FORGET ME NOT Water Tankard Set. 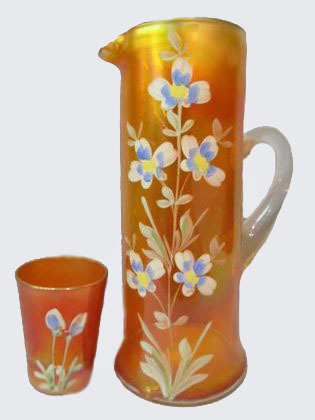 Left - FORGET ME NOT-Tankard Set. Middle - FORGET-ME-NOT on BANDED DRAPE Pitcher. Right - FORGET-Me-NOT with larger, fewer flowers. 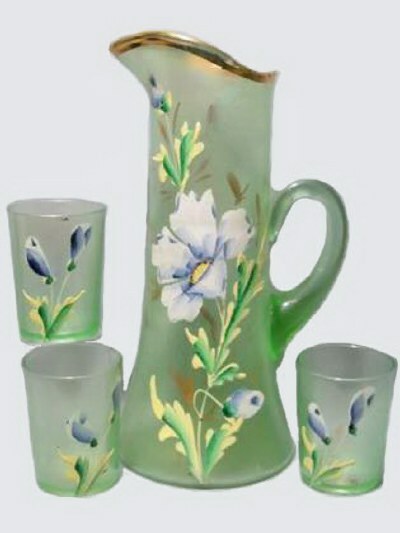 FORGET-ME-NOT Tankard sets: The varying degrees of artistic touch are clearly displayed in these three versions of the pattern. 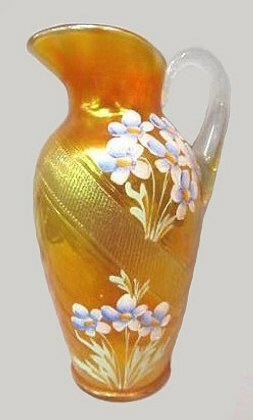 The Fenton Banded Drape #1016 lemonade pitcher is usually found having the Iris painted design. 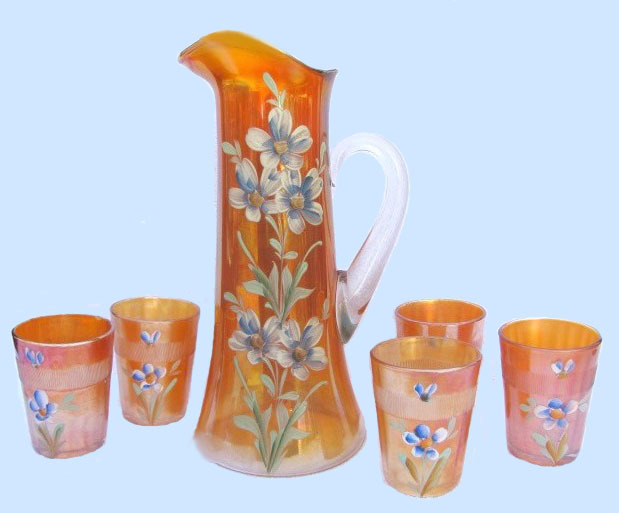 Since both Fenton and Northwood produced hand painted water sets, with many of them unrecorded in carnival glass books, it would be difficult to ascertain the maker of the two tankard types. Another difficulty of proper identification is that various writers apply differing pattern names to the painted designs. Amethyst & Marigold FORGET-ME-NOT Tumblers. FORGET-ME-NOT Tumbler: The Richard Owens tumbler book displays one such as this having a prism type band slightly raised from the smooth surface of the glass. The base color of the glass is blue. He does not mention any variations. That book was printed in 1973. This tumbler belonging to Greg Lockhart lacks that prism band surface and is amethyst base glass. 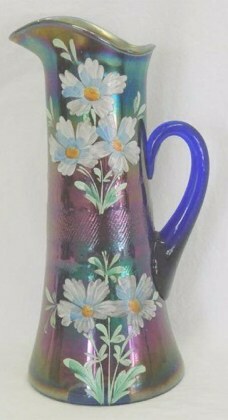 Does anyone have an amethyst pitcher or tankard having the same painted design? 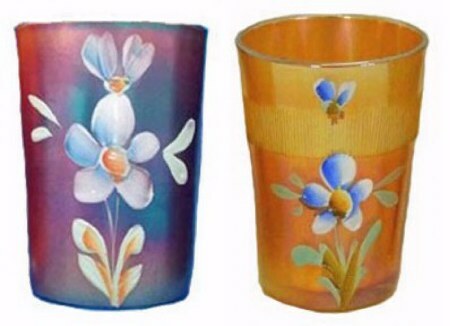 Close scrutiny of the painting applied to the marigold tumbler offers exemplary differences in application of design. (Every artist offers a differing touch with that paintbrush!). Differing PERIWINKLE Sets: A good question is whether Fenton and Northwood each presented a version of the pattern? 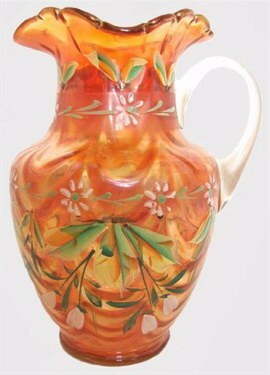 Seeck Auctions sold a marigold Cannonball-style water set with a design like the one seen here on the tankard sitting to the right. 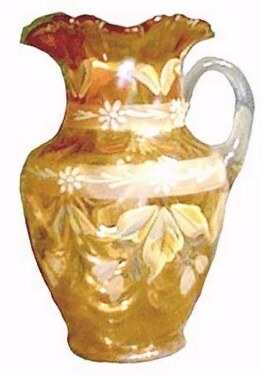 Since both producers utilized that pitcher shape, it offers no solution to the puzzle. Preach the word! Be ready in season and out of season. Convince, rebuke, exhort, with all longsuffering and teaching. and they will turn their ears away form the truth, and be turned aside to fables. For I am already being poured out as a drink offering, and the time of my departure is at hand. will give to me on that Day, and not to me only but also to all who have loved His appearing.